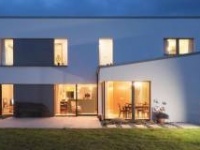 This pioneering deep energy upgrade of a 1960s home in Wicklow will take place in phases over at least five years, with the aim of making it more affordable to go passive by renovating on a step-by-step basis. The most daunting aspect of any building project is always going to be the cost. 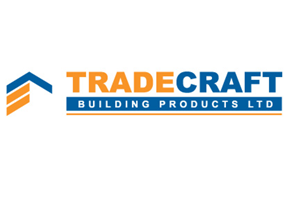 Deep retrofits, designed to transform the comfort and thermal profile of a building, don’t come cheap. One solution is to stagger the work, to create a long-term plan in which that transformation is phased over ten, fifteen, even twenty years. That’s exactly what Mariana Moreira and Art McCormack did when they set out to retrofit their 1960s built/1990s refurbished family home — dubbed Stella Maris — on an exposed hillside in Co. Wicklow. 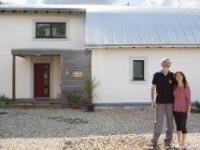 It’s fair to say the couple have passive house running through their veins. 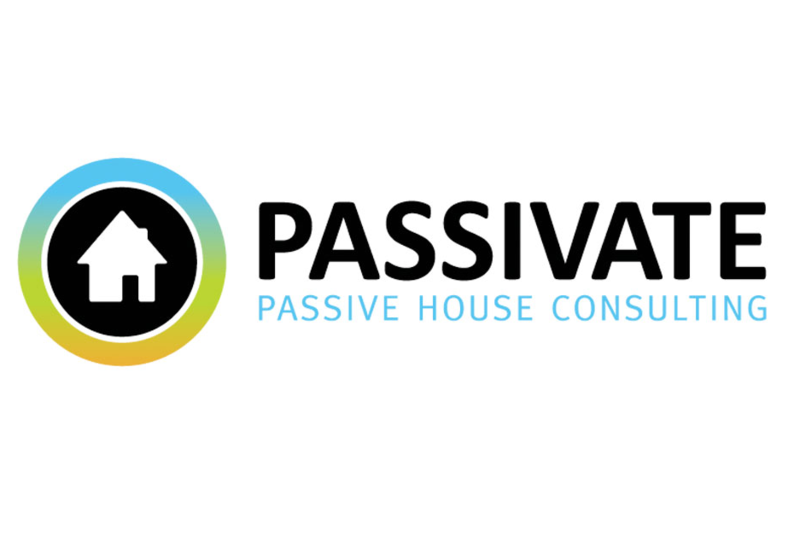 McCormack is a co-founder of passive house architects and consultants MosArt and the Passive House Academy. Moreira and McCormack – both of whom are architects and certified passive house designers – both work for the two organisations, and therefore knew that an exposed location doesn’t have to mean a cold house. “I can see the north pole from here,” says McCormack, “or at least that’s what it feels like when the wind blows from the north and from the east off the sea.” The wind whistling through the house – carrying all the heat away with it – was what prompted the need for the retrofit in the first place. Adopting a phased approach was all about making the works affordable. And, as Moreira points out, by front-loading the work that will deliver the highest energy savings, those reduced running costs free up resources that can go towards future works. 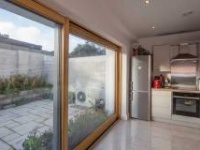 The project – which will aim for the passive house retrofit standard, Enerphit – is a participating project in the Passive House Institute’s (PHI) Europhit programme, which supports step-by-step Enerphit projects. Europhit has also produced a brochure that highlights its successes and showcases a series of demonstration projects (including Stella Maris) underway in 11 EU member states. To that end, developing — at the outset — a thoroughly detailed plan which specifies the full scope of the works across all phases is vital. At Stella Maris, McCormack and Moreira have planned three phases. The first, completed last November, centred on retrofitting the roof and northern elevation. The second phase, due this summer, comprises mainly internal works, and includes the replacement of the original open fire with a wood burning stove. The final phase — planned but not yet scheduled — will see the completion of the remaining elevations together with a ‘modest’ extension facing south in the central portion of both floors. Phasing works throws up a variety of issues that don’t arise in one-fell-swoop retrofits. At what point do you think about ventilation for example? If airtightness is to be improved, a ventilation strategy needs to be put in place, but does it need to be implemented in the first phase, second or the third phase? “The owner must have consultant expertise behind him to guide him through the process,” says Moreira, who adds that the Europhit project also provides the much-needed guidance and theoretical rigour to support step-by-step plans. A close look at Stella Maris reveals how the completed first phase anticipates the work to come. The orientation of the house presented something of a challenge. Views of the sea and mountains lie to the north, while the southern aspect looks immediately to the upward slope of a planted hill. Moreover, the house itself stands at quite a high altitude, putting it, as McCormack points out, in the direct line of fire of the north wind. The roof was stripped back and an airtight layer installed above the rafters, surmounted by two separate layers of Rockwool insulation. In addition, 100mm of mineral wool was installed between the rafters. The insulation, wind-tight and airtight layers were continued down to the verge overhang, where they now sit, awaiting the completion of external insulation on the gable walls at a later phase. Hitting the pause button on a retrofit project throws up aesthetic issues too. If some elevations are left untouched, does this mean you get ugly overhangs that just can’t look good until the project is completed? What about windows? If you’re replacing windows now but not externally insulating until five years’ time, how do you position them so that you get optimal performance and a reasonable aesthetic between phases? Moreira says that these are certainly challenges, but suggests that they’re really no different to the architectural challenges presented by any retrofit project. She points to a number of projects where these issues were handled in creative ways. “There is a potential to look odd; one façade looks new but this other façade looks dull... our front façade has new windows and door and it looks very nice and sharp, then you look around and see the other façade unchanged...but you can work around this. It’s down to the architect to be clever and mitigate these issues,” she says. There’s always a risk too that by the time you hit phase two, all of the great things you did in phase one will seem outdated and you will be niggled into revisiting work. She points out too that this year’s passive house conference in Darmstadt saw a review of the performance of the first ever passive house built by PHI co-founder Dr. Wolfgang Feist 25 years ago. Despite the fact that all of the components used in that house are now well out of date, they continue to deliver excellent results and do not need replacing. The house’s west façade — a remnant of the original cottage — includes an architectural feature that’s about as far away from passive house convention as possible: a scattering of glass blocks cut into the 215mm block construction when McCormack renovated and extended the house in the 1990s. Inspired by Le Corbusier’s chapel of Notre Dame du Haut, the blocks add an architectural flourish. “It’s as is if it’s water reflecting from the walls,” says Moreira. This wall wasn’t touched during the first phase of the Enerphit project, but as Moreira explains, it will be tackled when the remaining walls are externally insulated in the next phase. “We will keep those glass blocks visible, so we’ll have to cut holes in the external insulation. We know it’s a weak point in the thermal envelope, and we have accounted for those heat losses in PHPP [the passive house design software], and it’s not affecting the result as it’s such a small area.,” she says. “In Enerphit projects we have to be aware of these weak points and mitigate against them in terms of thermal bridging and condensation risk as much as possible, but existing building fabric has its own value and history. Because the works to roof and front elevation were likely to increase the airtightness of the house substantially, it was decided to incorporate the MVHR system in the first phase. An airtightness measurement was carried out prior to the first phase works started, giving a result of 5.8 air changes per hour, at 50 Pascals of pressure. Once the first phase was completed the building was tested again, hitting a result of 2.4. Because the machine faces the inside of an as-yet uninsulated external wall, some stripping away of this work is inevitable during the third phase in order to re-connect to the new attic gable wall fabric. It is of course important that the house remain habitable throughout the three phases envisaged in the project, which is partly why most of the specified works are external. “All the insulation is external,” says Moreira, “so there’s no mess inside the house. I know that sometimes interior works can’t be avoided but if it is possible, external works should be the solution.” Stripping back the roof from the outside allowed access to the rafters for the installation of both airtight membrane and insulation, obviating the need to come through the house. And as Moreira points out, installing the airtight membrane in this way made it easier to achieve airtight connections between roof and walls. Staying with the roof, the design team ran into an unexpected issue which they believe is worth highlighting. The original roof build-up had envisaged full fill mineral wool between 175mm rafters, then the airtight layer above the rafters, topped off with 150mm rigid Rockwool boards. 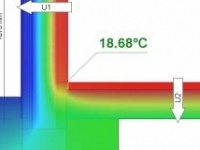 The hygrothermal analysis which revealed this issue was carried out by Andrew Lundberg of passive house consultancy Passivate. The point, says McCormack, is to at least consider the hygrothermal risks in retrofit. “Don’t just presume that it’s ok to add loads of insulation inside the airtight layer in order to achieve a low U-value,” he says. While the project aims to secure Enerphit certification once completed, the Passive House Institute is currently introducing a new endorsement initiative designed specifically for step-by-step retrofits. It will soon be possible to get a step-by-step Enerphit plan certified by the Passive House Institute once the first step has been completed. The first stage of the project has delivered massive improvements, bringing the house’s space heating demand down from 172.9 W/ m2K to 55.2 W/m2K, eliminating the drafts and dramatically improving comfort levels in the house. Building type: 140 square detached 1960 family home. Enerphit step-by-step refurbishment. First step complete during 2015, including roof refurbishment, roof lights replacement, front wall refurbishment, front windows and glazed door replacement, heat recovery ventilation installed and balanced. Completion date: First phase 2015, second phase 2017/18. Before: Viessmann condensing gas boiler (efficiency over 90%). Evacuated tube solar thermal collector.